Something New on the Plate! Last fall, the Master Gardeners were looking at some new ideas to enhance the varieties of produce at their market garden. They were looking at eliminating some that were not the best for us such as okra which does’t respect our work and market day schedules. It grows too fast and gets woody before we can harvest and market it. For something different, I suggested shishito peppers (enunciate the name carefully). They are a mild wrinkled green Asian snacking pepper that is usually sautéed. I found them at a local grocery store last year, tried them and really enjoyed them as something good and different! About one in ten has a kick which adds to the excitement of eating them. I have been tossing a few on the grill until they are tender and pick up a hint of char. Last weekend, one of the garden co-chairs brought me a bag if shishitos to try. It had both green peppers and some that had ripened to a bright red. On the drive home, I had to taste one of each – a green one, with the expected not quite raw bitter flavor, rather than pepper heat, and a red one which was surprisingly sweet! 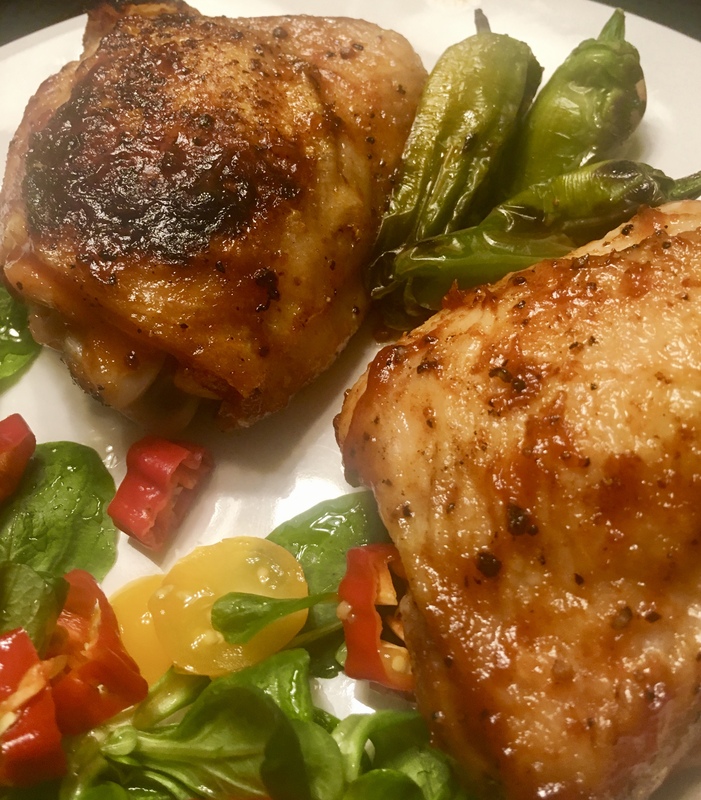 I grilled a couple of chicken thighs and a few green peppers. I also made a salad of mache greens, yellow cherry tomato slices and slices of red shishitos with a light vinaigrette. It was a wonderful salad! Visit Ardovino’s Farmers Market on Saturdays and give the shishitos a try. You’ll enjoy them green or red. Grilled chicken thighs with grilled green shishito peppers and a salad mache rosettes yellow grape tomatoes and sliced raw ripe shishito peppers in a light vinaigrette. Dinner cooked on an outdoor gas grill after the temperature dropped below 100.